Mr. Myrick studied Choral Music Education at Wichita State Graduate School of Music and earned a Bachelor of Vocal Music Education from Wichita State University. He also holds a Master of Arts in Instrumental Conducting from the American Band College in Ashland Oregon. Brian plays various instruments, his main instrument is his voice. He has studied with several voice teachers over his life-time including Alan Held and Ed Cook. 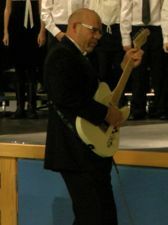 Mr. Myrick is currently the Upper School Music Director at St. Paul’s Academy in Bellingham, Washington where he teaches band, choir, and general music . He sings with the Bellingham Chamber Chorale is a member of National Association for Music Education, American Choral Directors Association, and the American Legion.